While summer is coming to a close, our love for white's and summer brights are not fading anytime soon. Last weekend Ivy put on this pretty lace number for a day of hanging out with family and friends at our house. This dress is prefect for formal occasions like baby showers and graduation parties but just throw on a black leather jacket and this classic dress turns edgy! We're not a fan of rules, so wearing white after Labor Day is just our type of rebellion! Join JustFab now and enjoy $15 off your first purchase! In today's world, you can basically order anything online, without the hassle of having to get out of bed, put on makeup, and drive. Let's be real, we are lazier shoppers today than we were just a few years ago. Something that hasn't changed over the years though is the joy and excitement of getting a package in the mail! That's why we think subscription box services are so awesome!! Over the years, we have joined numerous services (some we have been subscribers for years). We've put together our top 5 subscription box services for 2017. Frisky Britches - For just $14 a month, you receive two adorable and comfy undies right to your door! They have three different subscription options; "The Kitten" which includes two cheeky undies, "The Kitty" one cheeky and one thong, and "The Kougar" two thongs. We also love the brands they use like Honeydew and René Rofé. This is a great option for those of you who hate going to Victoria's Secret or just love having new cute undies. FabFitFun - A quarterly subscription box FULL of the seasons' most coveted products. Each box is worth over $200 and filled with loads of full sized products ranging from fashion, jewelry, fitness, and more! Quarterly subscriptions cost $49.99. We recommend purchasing the yearly subscription for $179.99 which allows you to customize your boxes and get first access to add-ons and other fun goodies! Bonus: Sprezzabox - This box is the perfect subscription box for any stylish guy- or one who needs a little help in the style department. Each month, you receive 5-6 handpicked men's fashion and lifestyle items for just $28. Boxes almost always include a tie, socks, and pocket square as well as 1-2 other style items and 1-2 lifestyle/hygiene product. If you think subscription boxes are just for ladies, we promise your guy won't be disappointed! We have given these subscriptions as gifts to several of our favorite guys and they have loved them! One of our Past Glam Bag from Ipsy! Full-size lipstick, nail polish, perfume roller, concealer, and a half size eyeliner. One of the wines we received from Winc. Don't you love the label?! Some Sprezzabox goodies including a tie, pocket square, cigar cutter, pin, and socks. Stretch! We rarely stretch in the mornings, our alarm goes off, and we reluctantly crawl out of bed. Stretching first thing before getting out of bed feels so good! Good vibes. If you still need to set an alarm, set one on your phone that reminds you to enjoy and appreciate all you have. Ivy's alarm has hers say "Thank you for today" to remind her to be thankful. Go electronics free. We are on our phones, computers, or watching TV so often at home. Take time to wake up without checking these things- maybe read a book, newspaper or magazine- you'll have time to catch up later. Play some soft music or open a window and listen to the birds outside. Enjoy coffee. This goes for tea as well, but take a moment to enjoy it not gulp it down and rush out the door. Appreciate that you are in no rush, and that you can be lazy and not get dressed right away-relax in your undies! Splendies is a monthly underwear subscription service. For only $13.99, you get three adorable undies each month! The service is totally catered to your taste, you can request certain kinds of underwear or ask for it to be a surprise! The quality is great and they have a huge selection of sizes. We love getting new undies every month. What girl doesn't?! Thank you Splendies for partnering with us on this post! Skin is essentially the canvas that makes up who you are on the outside. Appearances aren't everything and we are firm believers that beauty comes from within, and yet that doesn't mean you should neglect your skin. That is why skincare is our most important beauty ritual! We paired with our favorite skincare company CeraVe to share with you our skincare stories. When Ivy was in high school, like many others she suffered from acne. She felt ugly and wanted to cover it up with makeup, the result usually made her look and feel even worse. With the combination of teenage hormones and strong over-the-counter skincare products (that irritated her skin more), her acne seemed to get worse. Eventually she went to a dermatologist who recommended she use CeraVe face wash and moisturizers. CeraVe, made for sensitive skin is fragrance free (a leading cause in skin irritation) so it moisturized and soothed her skin. Ivy's skin started becoming less inflamed and her acne was reduced. Her dermatologist recommended a prescription medication in combination with CeraVe and eventually she became acne clear. CeraVe counteracted the drying effects the strong medications created. During that time she opted to use the CeraVe PM face moisturizer morning and night to keep her face from becoming dry and flakey, and it's still her most coveted product. Now Ivy continues to use CeraVe products daily and has come to love even more of their products over the years. Eve started using CeraVe around the same time to soothe her sensitive skin. Eve's skin is fair and can become dry, red, and irritated easily, so finding products that calm and hydrate her skin can be tricky. Eve spent a fortune on fancy skin creams and serums but nothing really worked. One day she swiped some of Ivy's CeraVe PM lotion and was hooked. Seriously, within a week her flaky irritated skin was a thing of the past. She, like Ivy, now uses the PM and AM face lotions daily. Her most recent skin saving product is the CaraVe Eczema Soothing Body Wash. Eve uses it everyday in the shower and loves its hydrating effect. CeraVe has really been a lifesaver for our skin. The products are affordable (you can get them at almost any drugstore or supermarket), and really do work! Do you love CeraVe products? Tell us your skincare story! CeraVe PM Facial Moisturizing Lotion- Our favorite and most used CeraVe product. We don't know how we could go on without it. CeraVe AM Facial Moisturizing Lotion- A great lotion for everyday. It has SPF 30 in it to help protect you from the sun while still providing your skin relief from dry skin. CeraVe Hydrating Cleanser- Ivy uses this every morning and night to keep her face clean and hydrated. It won't dry out your face like some face washes can. CeraVe Foaming Facial Cleanser- Ivy uses this facial cleanser when she showers. It leaves her skin feeling refreshed and clean without drying it. CeraVe Hydrating Body Wash- A new favorite of ours! This body wash is VERY moisturizing. It is similar to some in-shower body lotions we have tried, but doesn't leave you're skin feeling like it has filmy residue. CeraVe Eczema Soothing Body Wash- This is Eve's favorite body wash as it works wonders on her extra dry skin. It doesn't foam like other body washes but it leaves skin clean and super soft and moisturized just the same. Healing Ointment- This is simply an amazing product. We use it on dry hands, elbows, and even chapped lips. It is odorless and tasteless so it's great for any dry skin issue! Thank you CeraVe for partnering with us for this post! There are few things in life one really cannot have too much of...diamonds, champagne, and cute shoes included. We are always on the hunt for cute yet affordable shoes. We have purchased budget friendly shoes from lots of popular stores and have found that you really do get what you pay for. So how can a girl get her perfect pair(s) without breaking the bank? No need to fret. We found the perfect store for any shoeaholics needs: GuiltySoles. Marilyn Monroe once said “Give a girl the right shoes and she can conquer the world”, and we couldn’t agree more. When you have your perfect pair of heels, booties, or flats on you radiate confidence, and feel like you can conquer anything. We love that feeling, and want everyone to feel that way. We discovered GuiltySoles from a Facebook ad, and decided to take a leap and try them out. GuiltySoles has an awesome selection of trendy shoes all at affordable prices. This made picking the styles we wanted really difficult! We ended up agreeing upon the LOLA flats and the CASEY heels (lucky us - we have the same shoe size and can share!). When they arrived, we were surprised by how pretty the packaging was. Usually budget shopping means ugly grey plastic shipping bags. Not GuiltySoles! The shipping box had the phrase "oh so guilty" on it which was cute, and inside were beautifully packaged shoe boxes. Each shoe came with a silky dust bag to hold your precious pair...we really loved this detail. Another awesome addition to the Casey heels was the replacement heel caps, which we found out come with every high heel purchase! The quality of each pair of shoes was impeccable, and impressed us for the price. In fact you really don’t need to feel guilty for splurging at all. Call yourself a “Good Sole” (wink wink)! Find your own Solemate at GuiltySoles and use our code IVY&EVE25 at checkout for 25% off your total purchase!! Thank you GuiltySoles for partnering with us on this post! Do you ever feel like you need a vacation in the middle of the week, in a meeting, or really anytime you're not on one? We do all the time! Recently, we re-discovered the wonders of essential oils. We always knew about them but never used them regularly. When we found Organic Aromas, with their spa worthy diffusers and oils, we decided to treat ourself to an at home mini spa-vacation. We have put together some tips for you so you can have a mini-vacation for your senses without having to actually leave the house (or your bed)! Get your own Organic Aromas diffuser or essential oils for your own mini spa-vacation. Use discount code SHAREME for 15% off your purchase! We use this beautiful essential oil diffuser and essential oils by Organic Aromas. We love this company because it's oils are made organically, and the diffuser does not dilute (no water needed) or contaminate (it's made with glass rather than plastic) the oils. We have their Radiance - Nebulizing Essential Oil Diffuser which is hand made and the glass has intricate swirling designs along the sides. It also has a color changing light at the base, which you can turn off if you are trying to sleep. It is truly a work of art on its own. We paired it with the Ocean Breeze Essential Oil which smells lovely. Our favorite part about the diffuser is that it is silent, and it is very elegant, unlike many of the other chunky plastic diffusers on the market today. Set the mood for your ears with some calming music. You can find music titled "Spa" "Calming" and "Relaxing" all over the internet. Here are a few of our favorite songs and playlists to get us in the R&R mood. Relaxing Spa Music (6 hours)- For 6 hours of uninterrupted peace this is the perfect spa background music. Plus its free on Youtube! Relaxing Beach Music- This will take you to a tropical beach or stream without having to take a plane or train. Enjoy! Fairy Dance- Peter Pan Soundtrack- This was one of Ivy's favorite songs to play before going to sleep at night when she was younger. Almost the whole soundtrack is nice to listen to while enjoying some "me" time. The Organic Aromas diffuser is by itself beautiful enough to watch with its mezmerizing color changing lights; but if you want a little something more, we recommend finding a place in your house where you can look outside and enjoy nature, or watch a travel show to really "get away". We love watching Rick Steves travel shows which you can watch for free on PBS. If you are listening to music, grab your favorite travel book or novel set in an exotic place! There are endless ways to escape for just a little while. We love how when we visit a spa, they usually have a few items to munch on while you wait for your treatment or while you enjoy the facilities. We recommend cutting up some apple slices, oranges, and mix together some nuts and dries fruit. Aveda Comforting Tea- We first discovered this tea when we took a trip to our hair salon back in middle school. It is so delicious and has a calming, comforting smell. Republic of Tea Get Gorgeous- True beauty comes from within, but this tea also helps with clear skin. So it leaves you beautiful inside and out! Yogi Tea Relaxed Mind- Made with Lavender and sage to bring your mind to a state of tranquility. Take a sip and feel yourself relax. To rejuvenate tired skin, add a few drops of essential oil (1-2) to some fractionated coconut oil (get some here). Rub onto skin. If you are lucky maybe your Bae can give you a massage (hint, hint). We also think this is a perfect time to put on one of your favorite sheet masks to really get that "vacation glow". Here are our top fave sheet masks right now! Sephora Collection Rose Sheet Mask- We have tried all of Sephora Collection sheet masks and love them all. The rose mask helps brighten and moisturize. It smells so good too! Tony Moly I'm Real Red Wine- This mask is for reducing the size of pores while tightening and purifying. We tried the mask and liked it but to be honest, we just love this one most of all because well, WINE! Leaders Moisturizing Recovery Mask- This mask is made from bio-celulose coconut gel and is the most moisturizing mask we have ever tried. It sticks to your face like a second skin and when you take it off, you seriously see and feel the moisturizing effects all day long. Masque Bar Green Tea 3-Pack- We first discovered this brand in England and are so excited that they are now available in the USA! We like all of the Masque Bar sheet masks but Green Tea is our ultimate favorite. It is moisturizing and lifting making your skin feel completely refreshed once you take it off! **Always test essential oils on small portions of skin before rubbing it on large sections, you're skin may be sensitive. Remember essential oils are concentrated and can sometimes irritate skin if not diluted. Read more about oil safety here. When you feel stressed and in need of a mini vacation, how do you relax? Share your tips in the comments below! Thank you Organic Aromas for partnering with us for this post! Valentine's Day is one of our favorite holidays to celebrate. It's at the start of a new year, spring is in view, and everything about the holiday is pink and about LOVE. This year we are planning to put on a Galenetine's Day Brunch for some of our special gal friends to share our appreciation and love for them! We have picked out some gifts we think are almost as awesome as your Valentine or Galentine this year. What are you planning for this Valentine's Day? Let us know in the comments! "Love You A Bunch" Rosé Roses gummies by Sugarfine- For your friend that is just too sweet for words! BootyBag Monthly Subscription- For everyone! Who doesn't need more undies?! 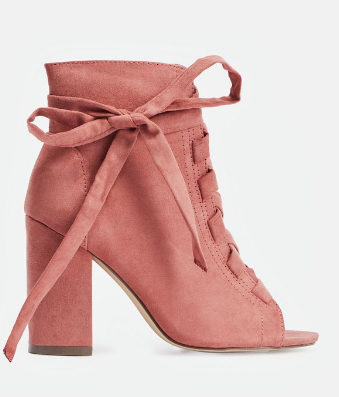 Scotia Heeled Booties by Just Fab- For your fasionista babe. Arrow Pendant from Tiffanys- A hint for all the BFs out there! Wink wink!!! The Everything Pouch by Packed Party- For your party pal who loves confetti and dancing all night. Jungle Cat Valentine Cards from Paper Source- Our go-to Valentines for this year. How cute are the sayings?! Ivy loves faux fur coats and has been dying to get her hands on a mixed color coat like this one for over a year. Two years ago when the faux fur coats were making a comeback Ivy purchased an all black coat which she wears religiously in the winter. What makes fur coats so great is that they can dress up any outfit. On this occasion, Ivy is wearing this fun fur coat with a sweater and instantly her outfit is ultra chic yet comfy and wearable for everyday. Faux fur coats are the best of both worlds They look great and they keep you toasty warm...not to mention they are animal cruelty free! Recently we went wine tasting at Niner Wine Estates in Paso Robles on our way to a weekend in Cambria (more on that later). Eve carried all of her daytime essentials in this amazing Imoshion satchel. We love the roominess of the bag while it doesn't look overly large. The fun and lively interior pattern is an added bonus that makes us smile each time we open the purse to grab something. 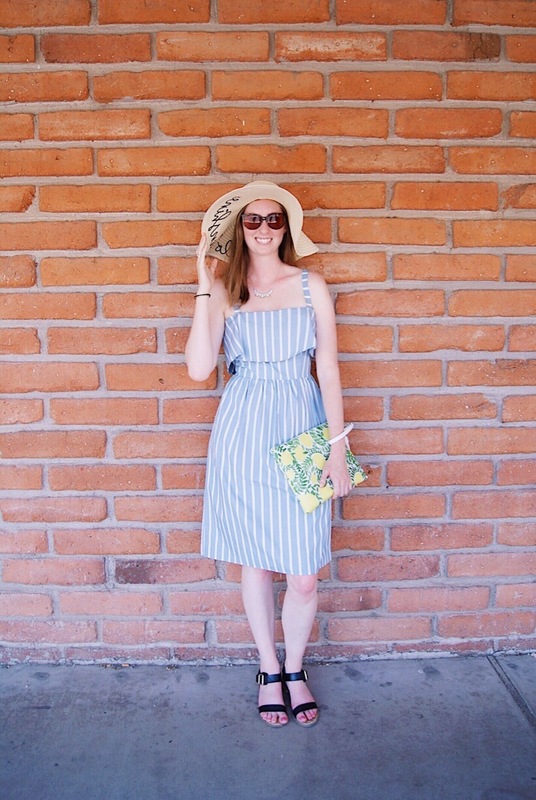 We love the neutral diagonal stripes that make this bag go with just about everything! Did we mention that all of Imoshion accessories are cruelty free, vegan leather? What's not to love? 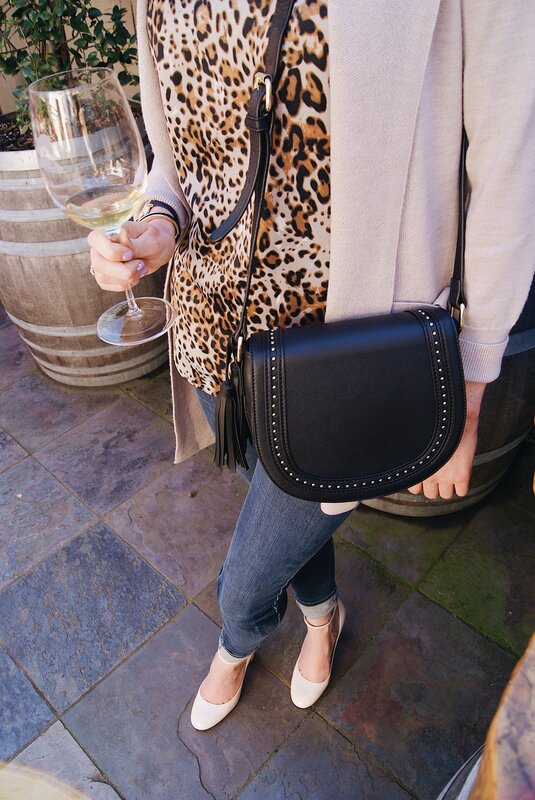 Snag this bag and many more awesome accessories for under $45 on their website! In case you missed it, check out a post on another adorable Imoshion bag here! If you haven't heard...we love champagne. No. We ADORE champagne and we love anything related to our favorite bubbly beverage. With holiday shopping in full swing, we have been looking for gifts to buy each other. The list of things to buy each other is so EPIC we decided we must share with all our other bubbly lovers. Here is a list of our favorite gift ideas for all the bubbly babes on your christmas list! 1. The carry on champagne cocktail by W&P Design. Now you can go anywhere and never be without your staple drink! 2. The champagne bottle clutch from Kate Spade. What gets better than carrying all your essentials in a glittery bottle of champagne? 3. Seriously- bring us champagne and we will get up faster then you can pop that bottle! Available here. 4. Stackable champagne glasses are the ultimate party trick and perfect for any Great Gatsby themed party! Available at Coupe Stack. 5. By now, we all know Sugarfina and their delicious champagne gummy bears. Not everyone knows about their bubbly bento box. This is the ultimate collection of Sugarfina's champagne candies including their baby champagne gummy bears, sparkle pops, and bubbly bears. What makes this bento box so special is that it's not only a collaboration with Johnathan Alder and the box is made with 24k gold, but the baby champagne bears and the bubbly bears are infused with Don Pérignon Vintage champagne! Hello YUM! Buy them here. 6. Because who doesn't need a champagne cork side table?! Available here. 7. Trust Fund Beauty's Champagne Socialite will make your mani go perfectly with your bubbly drink and on-trend velvet party dress. 8. Now you can subtly show off your love for bubbles and science! This necklace is shaped like a molecule of wine. Buy one here! 9. This beautiful and informative book about champagne will look perfect on anyone's coffee table! Available here. Lipstick is a girls best friend (OK maybe second to champagne). It can transform any look in just seconds! When we were younger we shied away from them because they seemed like an "old person" beauty essential, but now we realized how amazing they are (our grandmas were smart)! The only problem we continually run into with lipstick is having to reapply it after eating, drinking, and basically breathing. Lipstick just hasn't ever held up to our standards, until now. Let us introduce you to Maybelline Super Stay 24. Although it isn't in the standard lipstick tube, it truly is a lipstick in color and look. We were skeptical when we first bought the shade Always Blazing lip color but we were soon amazed by its performance. Simply apply the color to your lips as you would a lipgloss, let it dry (2-4 minutes) and then apply the moisturizing balm on top. We love the ultra-conditioning balm because it keeps your lips moisturized and happy. On an average day we only apply it once in the morning before work and by dinner it's still on and as good as when we first applied it. We wear Maybelline Super Stay 24 to almost every wine event we go to because we seriously don't need to reapply even if it's a 4 hour party with food and LOTS of vino. For the days we wear it from dawn to dusk though we will only reapply one time after dinner if needed (by reapply, we mean just a small touch up). Maybelline was not kidding when they said it feels just-applied after eating 300 cupcake bites, 120 coffee sips, and 99 kisses. The only bummer is most of the colors have an added shimmer (sometimes nice but we are more into matte lips). We have found three that are matte and mentioned them in our color review below. Perpetual Plum- The color is pretty similar to the online photo, however the shimmer does not show up as intensely once applied. This color ended up being the most popular in our family, we both have one and we bought our Mom one too. It's the perfect color to accentuate your lips without making it look like you tried too hard. Always Blazing- This is Ivy's favorite of them all. Unlike the photo online it is a bright red color and has no sparkle to it at all. If Ivy is wearing red lipstick in our style posts its most likely this color. See here, here, here, and here and the photo below. Keep Up The Flame- This is also a very red lipstick. It is a little richer (darker red) in color then always blazing and also is matte looking. Perfect for fall and winter looks or a night out! This is Eve's go-to red lip. Constant Toast- This color goes on much more translucent then we expected. We thought our lips were going to look like the ice princess lips, but the color was very light pink with quite a bit of shimmer. Although the color was fine on us (our skin is so pale!) we wouldn't recommend this for tanner people it may actually make you look like the ice princess, if your into that totes get it! On And On Orchid- We like this color because it's a bubble gum pink perfect to wear everyday, and it is also matte not shimmery at all. With the right lipstick you can conquer anything! One thing we love about going to San Francisco is that while daytime fashion tends to be pretty casual and practical, at night you can dress up and go out on the town! Ivy wore her new favorite body-con dress to happy hour and into the night while Eve wore her go-to cute yet casual tunic dress during the day. Can you tell we both LOVE grey? This year, we found an amazing online boutique called Stay Fierce Boutique. It is based in North Carolina and all of its products are under $35 and they have great dresses for any occasion! 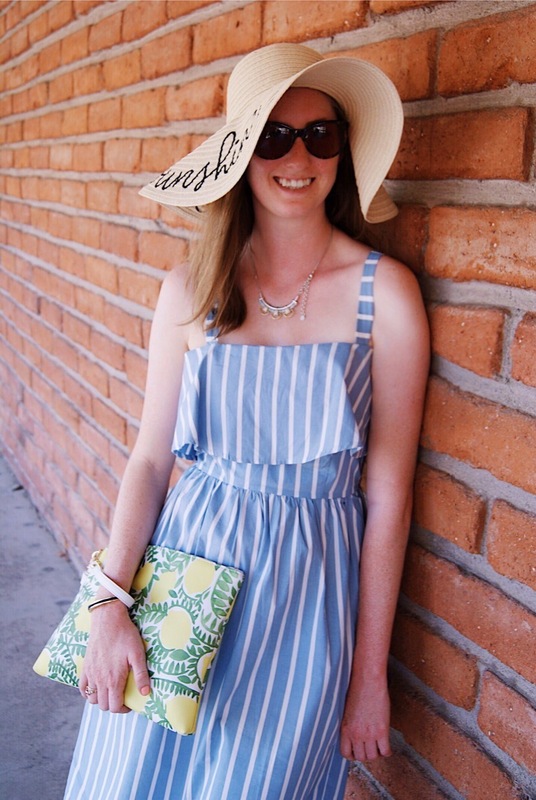 If you missed our last post featuring a Stay Fierce dress, find it here. We had such a fun time running around the city in our Stay Fierce Boutique dresses. Use our promo code IVYEVE15 at checkout for an additional 15% off your purchase through the end of the year!! As Christmas is right around the corner, we sat down together and created our wish lists. Target has been stocking its shelves with some adorable items lately, so we decided to make a wish list entirely from things we want from Target...Santa we would really just like a whole Target store for Christmas...The great thing about Target is you can find everything from glittery flats to monogramed champagne flutes and everything in between. It can be your one-stop-shop for all your Christmas shopping. All our wish list items are under $40 bucks so you really can get a bang for your buck! 2017 Sugar Paper White Weekly Planner- Perfect #girlboss accessory for the new year! Mini Bag Rocket Red- This bag is adorable AND affordable. Triple Tassel in Dark Berry- I'm in love with tassels right now. This would be great on any purse or car keys! Lotta Jansdotter 3pc Travel Packing Cubes- These are great for organizing your checked luggage. Sweaters in one bag, undies in another! Round Jewelry Box in Pink- This is just TOO cute! I want one in each color. Bag Keychain in Rose Gold- I can't believe this is under $8....crazy! Gold & Marble Tray- Perfect for a serving tray for any party! Diamond by FarylRobin Celinda Velvet Embellished Flats in Grey- These will go great to dress a casual outfit like jeans and a cute sweater, and will equally go great with my new holiday dress! Marble & Gold Barware Tool Set- Perfect addition to everyones bar cart. Pink Fur Mini Bag by Who What Wear for Target- Because who doesn't want a fluffy pink purse!? Hello Gorgeous Pink Mug- Perfect for your morning cuppa. Diamond by FarylRobin Celinda Velvet Embellished Flats in Wine- Glittery flats should be on everyone's holiday wish list! Naturally Eve and I both wanted a pair. Sugar Paper Wax Seal Set- A perfect way to make your snail mail look extra pretty! Round Jewelry Box in Turquoise- So cute & perfect for keeping your jewelry safe. This is my favorite color, but I'll take one of each please! Fur Mittens by Who What Wear in Light Brown- Perfect way to add some stylish flair to your hands when you're cold! When Ivy was in Montana a few weeks ago, she spent most of her time hiking, writing, and taking photographs. She packed cozy, warm, and wearable pieces for hiking up mountains and brought along her trusty THEIT Colt camera bag for her walks and trips into town. Luckily the daytime temps were warm (50's-60's) so she had plenty of room in her suitcase to bring home yummy Montana huckleberry jam, and mug candles! For Eve's birthday, we decided to spend the afternoon in Pebble Beach, CA. We headed to one of our favorite local places to grab a glass of bubbly and a bite to eat: The Bench. This place is great for any casual afternoon or evening drink. Sit at the communal outdoor fire pits and enjoy the view of the coastline and the 18th hole of the Pebble Beach golf course! We ordered a butternut squash flatbread, macaroni and cheese, and some portobello mushroom fries (which were all delicious!). After indulging, we took a short drive along Pebble Beach's famous 17 mile drive. While driving, we found a cool looking stand of forest off the side of the road. So we decided take a look around the trees. We loved the way our outfits blended in with the colors of the forest.